Cosmo Brand Polish & Our October Winner! 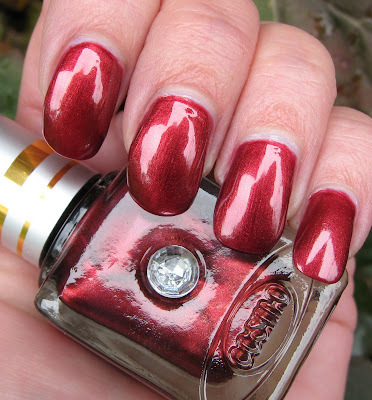 Above & Below: Cosmo brand polish in Under the Shade. I love this color! Our winner in the Body & Soul October Contest is none other than fellow blogger, Kris! Kris has the fabulous Kris Primps! blog and has made mention of going on a low-buy, although I haven't seen any signs of that yet! I'm just kidding Kris, congratulations! I used Random.org to choose the winner and the lucky number was 6. Let us know what you're planning on using your Victoria Nail Supply gift certificate for and which polishes Yen sends you for the discontinued/hard to find portion of the prize. I did ask her to include my NOTD polish I used yesterday, Viva La Vespa, as one of the selections, but I don't know what else she has in mind. 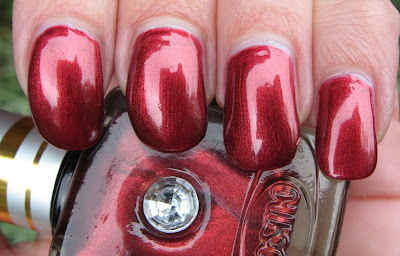 The polish I'm showing you today is a brand called Cosmo and there is little information about them online. I've only seen them at a very shady nail salon in my town...one of those places that I have a little apprehension about when I go in, but I usually manage to come away with a few good finds, so risking my life is always worth it. I've managed to pick several of these up over the years and I absolutely love them. They apply perfectly in 2 coats, dry quickly, and have a rather unique finish. 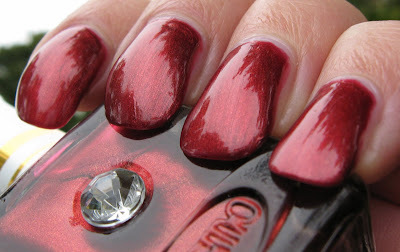 This one is called Under the Shade and it's a rustic red shimmer with a blackened base. The shimmer is so fine that the finish almost becomes foil-like or metallic when it's dry. I found one site that sells them online, but I don't know anything about them so I can't advise you to purchase these from them. I have heard others talk about randomly coming across them in small nail salons, so if you ever see one, I'd suggest picking it up to add to your collection. Last week I did a review and contest with Tarte Cosmetics on my blog and I received an e-mail from them about a great contest they're having. The Grand Prize winner will receive a prize package of Tarte Cosmetics worth $1,250.00 and the 2nd and 3rd Place winners will each receive a $200.00 Tarte Cosmetics Prize Package. It just takes a minute to sign up and there's no purchase necessary. When I entered, I also received a code for 20% off my next order. The contest ends 10/31/09 and here's the link if you're interested. Today's my husband's birthday, so I'm off to wrap presents and make his requested dinner. He doesn't ask for much and puts up with all of my nail polish and make up obsessions, so I figure it's the least I can do! Thanks so much! :) I am so psyched - having some rather rough weeks at work, and this has cheered me up. I love this color and the bottle. Today is my Son's 5th birthday too! LOVE that red! 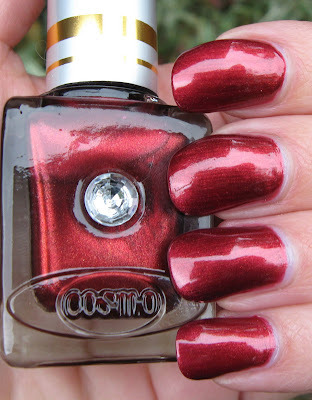 I have never seen or heard of Cosmo brand polishes before... but they sure do look like they're worth looking into, though! My fiance is the same way! He rarely raises an eyebrow at my nail polish addiction. I only feel like I have to hide my *large* hauls from him... hehehe! congrats to Kris!! This is a cool color but even cooler is that bottle! Fun! I love that bottle and the shade of red! Congrats to Kris! Happy Birthday to your husband Mary. Sure are a lot of October birthdays. Mine is Monday the 21st. What's your husband's favorite dinner? 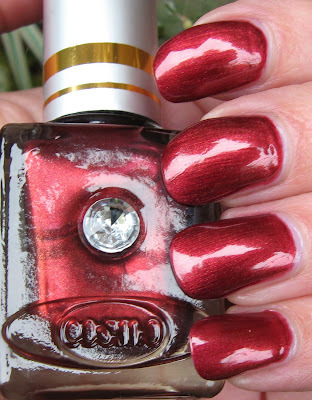 I like the jewel in the bottle of Cosmo polish. I've never heard of the brand either. It's a beautiful red on you. I'm in a dark polish mood. Must be due to all this dark, rainy days we're having. Have a nice weekend sweets! Natalie~thank you! I don't have many of this brand, but they're all very pretty. Kris~I'm sure you'll enjoy whatever you choose to get. Glad it made you happy :) I know what you mean about backlogs, look at my untried's! Evil Angel~the bottle is really nice, it's very heavy and the jewel is a unique addition. Happy Birthday to your son! Carley~they're cheap too, usually under $3.00! I don't hide my hauls, but I don't call attention to them either! We get a lot of deliveries anyway because of his business, so he just puts mine in my office and doesn't say anything...most of the time! BeautyJudy~the bottles remind me of Estee Lauder ones, heavy glass, square, etc. The jewel is a nice touch though. Chrissy~hello! Hope all is well with you. Glad you like the polish and the bottle. Lucy~there are tons of birthdays this month in our family! Early Happy Birthday to you :) I am so tired of the rain and clouds also. Enjoy your weekend! Cosmo's a popular salon brand here (Chicago) - my local beauty supply place carries these for $1 a bottle, so they are a cheap treat & surprisingly high quality. They also make some of the most gorgeous green shades (& lots of them) if you ever spot this brand. I actually picked up a couple of bottles today when I went hauling, "Frozen Waterfall of Color" is a shimmery pink tinged dark red (I think it has a micro glass fleck), very Xmasy & "NY Night Out" is a deep blue with purple tones & a little red microshimmer. Cosmo also makes a one coat formula (same bottle with a black cap) - not so many colors & the formula isn't as good. With the silver caps, beware, the formula takes a while to dry - SH Insta-dri seems to work the best as TC for me.